Identify Your Slot Car Motor! Over the next 8 webpages are images of motors, which are identified by numbers. At the bottom of each page is our best identification (so far) of that motor. Find a picture that matches your motor, and see if our Scratchbuilt.com community has identified it yet. Click here to go look at motors. Sometimes the identification (or a dispute!) might be on our Message Board, and I haven't copied it over here yet. So go look at the Scratchbuilt.com Message Board, in the category of Identify This Slot Car: Motor Quiz. Thanks! You can get a head start on identifying your motor, by identifying its General Type, below. See also the Can Motor Size Guide. These motors pre-date slot cars, were in wide use in the model train community, and crossed over to the model car racing hobby. 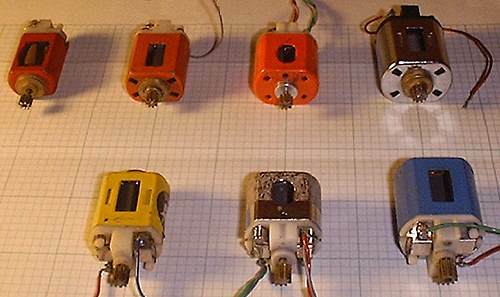 These motors were replaced by the lighter and cheaper can motors, and were rarely used in slot car racing (except drag racing) after the mid-60s. Mabuchi invented and was first to market these, in 1964, distributed through Polk's Hobbies to the manufacturers. The can design is still in wide use. This is today's production-class motor. There are standard sizes - see the Can Motor Size Guide. See images: M1-8, M9-16, M17-24, M25-32, M33-40, M51 & M54. These were invented by ? (Stuart Koford?) in the year ? Think of it as a can motor, minimized in every way, except speed and power. The can is cut away until it is almost gone, the stronger magnets are ground down lower, a smaller arm is used. This is today's professional motor.